by Neil Cole, Phil Helfer. Jossey-Bass, 2012. Deep church revitalization occurs from the inside out. Both authors are founding members of the Church Multiplication Associates. They argue that renewal is a process church leaders make motivated by vital faith and the ethic of love. These two form the bedrocks of congregational life. And growing out of them, the essential congregational DNA: Divine Truth, Nurturing Relationships and Apostolic Mission. 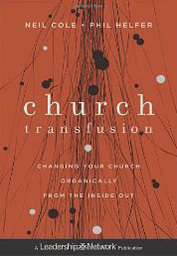 The book describes 10 transitions and the congregations who made them. Central to the presentation is the idea that leadership is key to transfusion: leadership that moves from control to the maintenance of order; leadership that moves from self-interest to selflessness; leadership that moves from position to submission; and from management to engagement. Finally, the book presents an important chapter on engagement: equipping persons for ministry beyond the church community. The book is a challenging and insightful look at congregational dynamics and how to remake them for a new century.